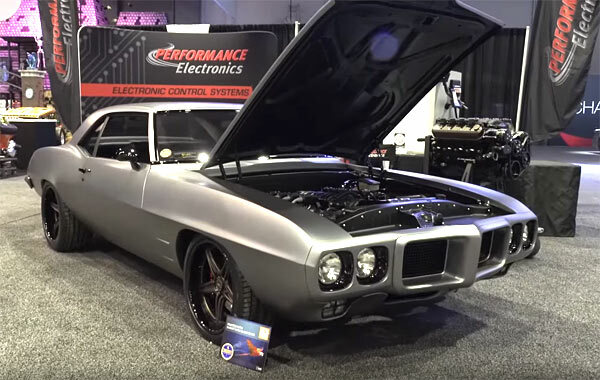 This rather cool looking beast is a 1969 Pontiac Firebird by Goolsby Custom. Originally brought in as a haul and wasn’t given an overt treatment, but just enough to keep all the original styling and give it the obvious air of a restomod. The video walks you through the car being shown at the 2017 Sema show with a description of why and how it was put together. The engine is a LS2, with a custom interior, bespoke wheels and a cool plain exterior. The original Pontiac Firebird design was good enough, so the vehicle didn’t need that much in enhancements. Basically, just replacing the bits that enhance the overall design. This first generation of firebird from 1967-69 had its design refined over the period, with the resulting ’69 model being one of the classics of the muscle car period. Just check out the video below to find out the full story on this magnificent looking vehicle.